The overarching of this Lexicon/Dictionary is to give a more accurate testimony to the influence and contribution of the Greek language to English! There are approximately thirty-thousand English words whose origin is Greek. It could have been easily double or triple this number if one includes derivative words, or many words that are part Greek and part Latin or few part French! I concentrated exclusively on words with Greek origin, only few with part Latin just as examples! The number of Greek origin is such that demonstrates how significantly English has been influenced and enhanced by the Greek Language! 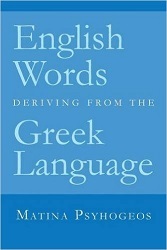 In fact many linguists believe that one of the reasons English has achieved such eminence and worldwide recognition and has become one of the richest and most adaptable languages is, the fact that it has incorporated within it the wealth of the Greek language, a language which has been characterized: unique, productive, viable, incomparable to any other language! To those epithets I added an inexhaustible linguistic source!!! The greatest value of this volume a) articulating the incredible number of Greek vocabulary which has enriched English b) the wonderful aid by providing an extensive list of combining forms (prefixes and suffixes). This list, really a word toolkit, will benefit anyone, be it any professional , word lover, world-puzzle enthusiast, spelling -bee candidate, students taking any kind of tests/exams (as SAT; MAT; LSAT: etc.) which will likely include a substantial number of these compounded words, c) the twenty Disciplines/Fields of Study, which have heavily borrowed from the Greek language and, d) last but not least and the most important discovery I made through researching and writing this book is the realization that whoever knows part of all the aforementioned benefits, is bilingual! An English speaker will realize that he/she is speaking another language ( Greek), the same applies to a Greek speaker realizing that knows English as well!!! It was an exhausting and sometimes overwhelming endeavor but in the end well worth it !! !